Nurungjibop is a traditional Korean food made of scorched rice. 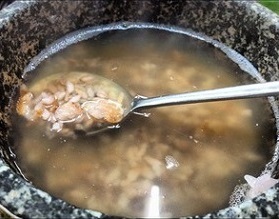 After boiling and serving rice in a dolsot or ddukbaegi, a thin crust of scorched rice will usually be left in the bottom of the cooking pot. This yellowed scorched state is described as nurung in Korean and nurungji derives from this adjective. Nurungji can be eaten in its crisp state as a snack or as an after meal rice tea by adding hot water or re-boiled with water. Nurungji in its broad sense also refers to the crisp crust that forms at the bottom of the pots and pans when cooking various rice dishes such as dolsot bibimbop and bokumbop. It is commonly served at restaurants that specializes soondooboo chigae, close to end of the meal. Also, various companies made nurungji available in a various pre-packaged forms around the mid-2000's and commercially available as snacks or instant meals.